UW Residence Life & Dining Services is working with the Agricultural Community Resources for Everyday Sustainability (ACRES) student farm to compost fruit and vegetable scraps and coffee grounds from the Washakie Dining Center and Wyoming Union. On average, the Washakie Dining Center donates about 264 gallons of vegetable rinds and peelings per week to the ACRES farm, says Washakie Executive Chef Mark Zieres. Dining locations in the Wyoming Union also donate their food scraps and the Rolling Mill Cafe contributes its coffee grounds. The scraps and coffee grounds are then picked up by ACRES farm workers, who compost them to make natural fertilizer. 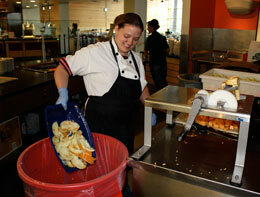 Other food waste, such as uneaten food from the Washakie Dining Center, is being pulped for compost (ground into small pieces), but ACRES cannot accept the waste because it contains meat. "Meat produces odors and attracts rodents to compost piles, which the farm is trying to avoid," says Zieres. "Despite not being composted yet, the pulped food still has advantages: pulped food waste takes up significantly less room in landfills than unpulped food." In addition to the limitations on the types of compost it's able to accept, ACRES is unable to handle a large volume of food waste because it is a student-run organization supported mostly by volunteer work. This limits the amount of food waste that UW Dining Services is able to compost through ACRES, but Dining Services is prepared to compost more when additional capacity or new composting options become available.